Ultimate™ Daily™ contiene las vitaminas y minerales que necesita para nutrición fundación, solido además de los nutrientes clave para apoyar la salud cardiovascular, inmunológico y el sistema nervioso. 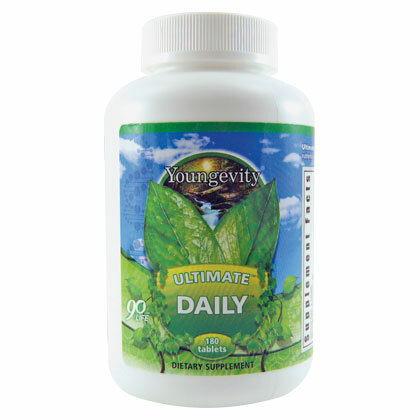 Ultimate Daily contains vitamins and minerals needed for nutrition foundation, along with key nutrients to support cardiovascular, immune and nervous system health solid. WARNING: May potentiate pharmaceutical MAO inhibitors. If you are pregnant, nursing or taking MAO inhibitors, consult your doctor before using this product. Accidental overdose of iron-containing products is a leading cause of death in children under 6 years poisoning. Keep this product out of reach of children. In case of accidental overdose, call a doctor or poison control center immediately. Directions: Take 2 tablets with each meal or as directed by your health care professional. For best results we suggest you use this product as part of a complete nutritional program that also includes Classic and Ultimate Ultimate EFA.